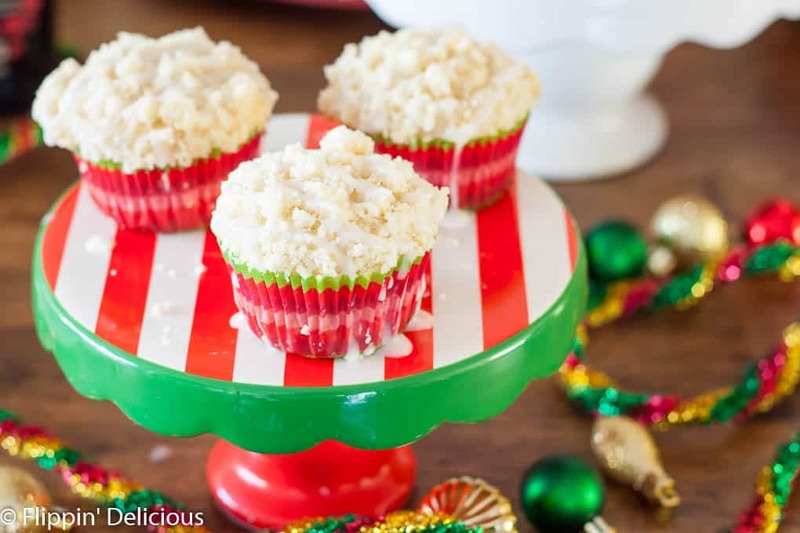 This Gluten Free Holiday Brunch has everything you need, including gluten free eggnog muffins with crumb topping, breakfast casserole cups, grapefruit mimosas, and a hot chocolate bar. This post is sponsored by Smith’s. As always, all opinions are entirely my own. 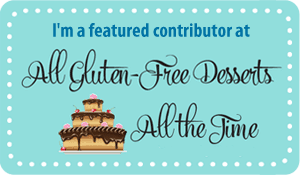 Did you know all of the gluten-free options Smith’s has? Thank you for supporting Flippin’ Delicious™ and the companies I work with. Happy #NationalGlutenFreeBakingWeek ! How appropriate that gluten free baking week is the same week as Christmas? 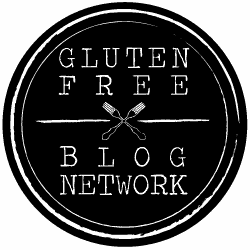 At this point in December my kitchen is filling with gluten free holiday cookies, muffins, chocolate, and maybe some gluten free cranberry bread. But I am not going to stop baking now! 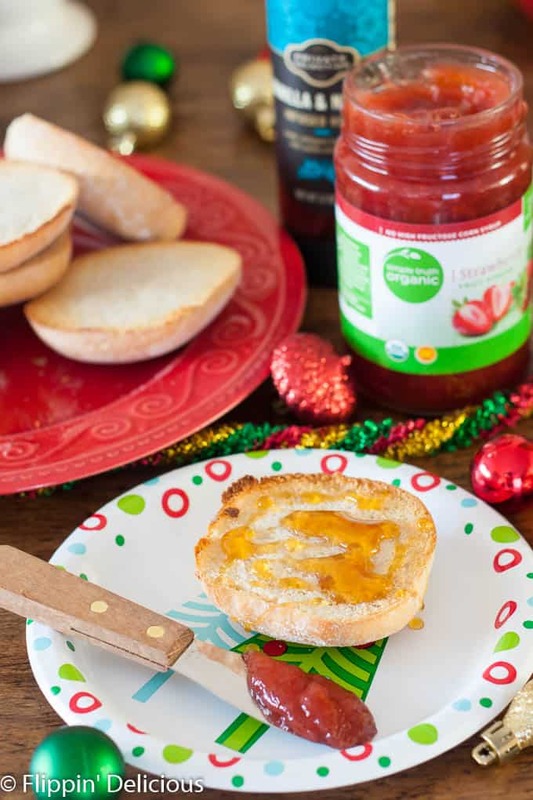 Smith’s is helping me to celebrate #nationalglutenfreebakingweek in style with these gluten free eggnog muffins and gluten free holiday brunch spread. 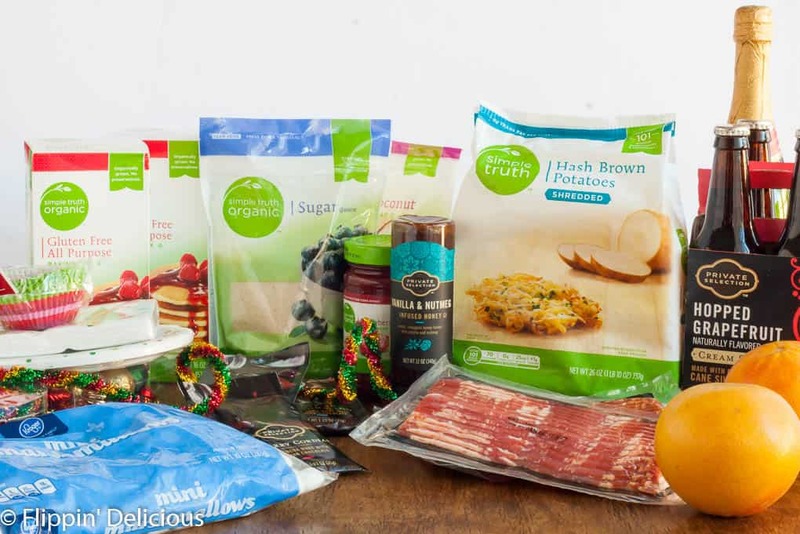 I love all of the gluten free Simple Truth and Private Selection ingredients that Smith’s carries! I was able to get everything that we needed for our holiday brunch in one stop at Smith’s, including the plates, napkins, and table decor! 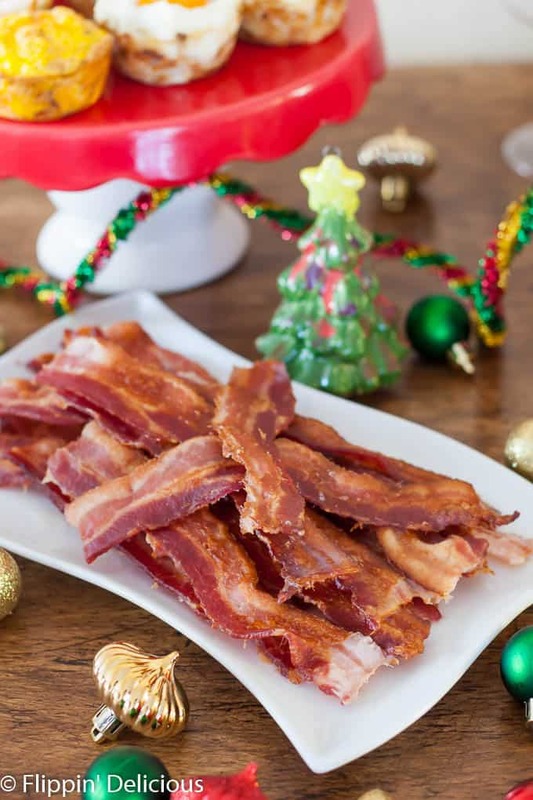 One of my favorite traditions that has carried over from my childhood is enjoying a gluten free holiday brunch after opening presents on Christmas morning. When I was a kid we would make stuffed french toast, gluten free coffee cake, and a breakfast casserole on Christmas eve and then heat them up while we opened presents so that we could enjoy a warm brunch and sip some hot chocolate after we finally calmed down from the excitement of opening presents. I like to continue this same tradition with my own family, but 100% gluten free. Obviously, it isn’t Christmas day yet, so my family has already enjoyed this gluten free holiday brunch spread, but I plan to whip up this feast for us again later this week. One chilly Saturday morning we invited my father-in-law and his girlfriend over and I baked up this tantalizing menu. Just add a few ingredients to the baking mix, like Simple Truth Organic Sugar and Cage-Free eggs, and of course a good swirl of eggnog for that festive holiday flavor (that I kicked-up-a-notch with some freshly grated Private Selection Whole Nutmeg) and you have gluten free eggnog muffins. I baked mine the night before so that I had more time on the morning of our gluten free holiday brunch to spend with my loved ones. The morning of our holiday breakfast, I put 2 packages of Private Selection center cut bacon in the oven, immediately followed by breakfast casserole cups. For the breakfast casserole cups I sprayed my muffin tin with non-stick cooking spray and then filled the cups with Simple Truth Hash Browns and sprinkled them with salt and pepper. 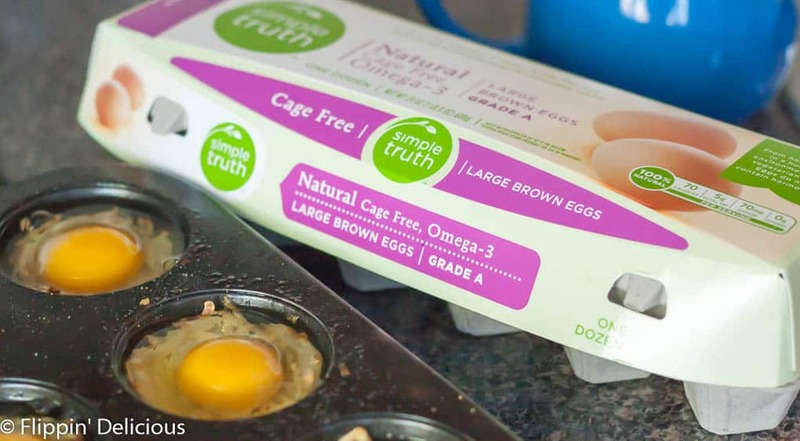 I baked them at 400F for about 15-20 minutes, or until they were just starting to turn golden brown, then I topped them with fresh Simple Truth Cage-Free Eggs. 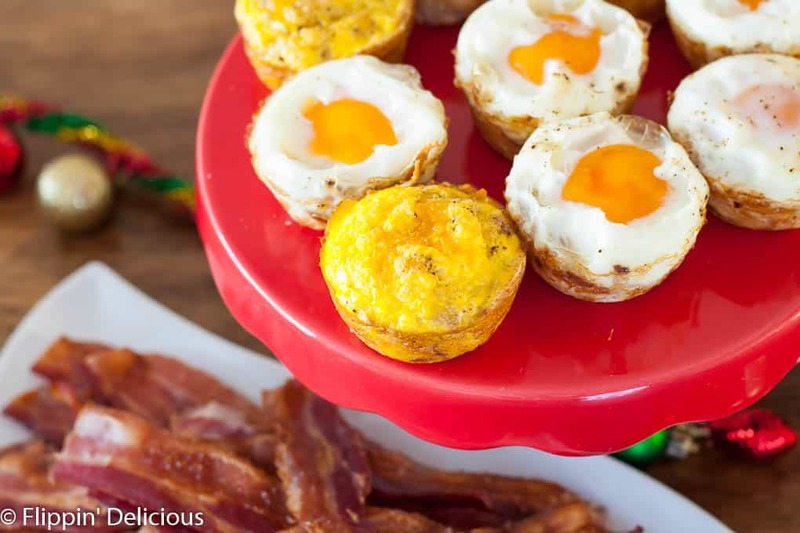 I whisked some of the eggs together to make scrambled-style cups, but the ones with the golden yolks were our favorites! 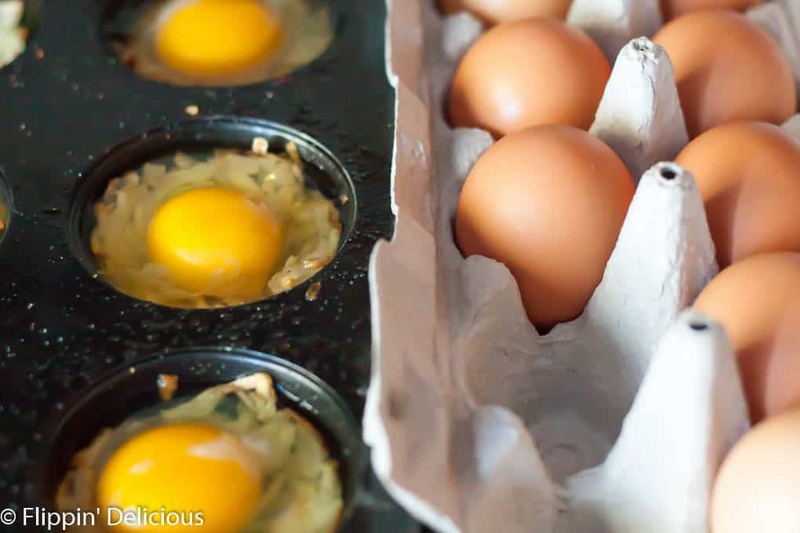 I popped the muffin tin back in the oven until the eggs were set, about 10-15 minutes. An easy way that I added some more variety to our Gluten Free Brunch was by toasting up some gluten-free bread (I love B-Free gluten-free buns that Smith’s carries, and is what I used) and served it with Simple Truth Organic Strawberry Preserves and Private Selection Vanilla & Nutmeg Infused Honey. OMG! 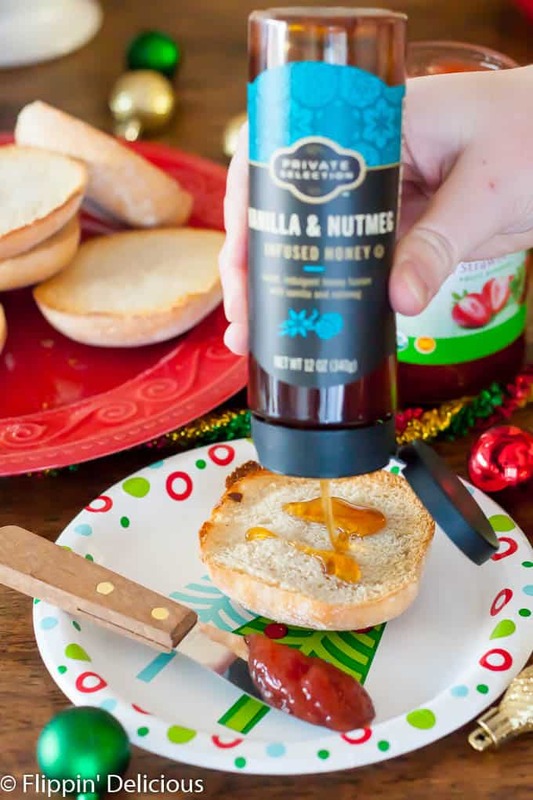 I want to put the Vanilla & Nutmeg Infused Honey on ALL THE THINGS! The drinks that we enjoyed were soooo simple and delicious! 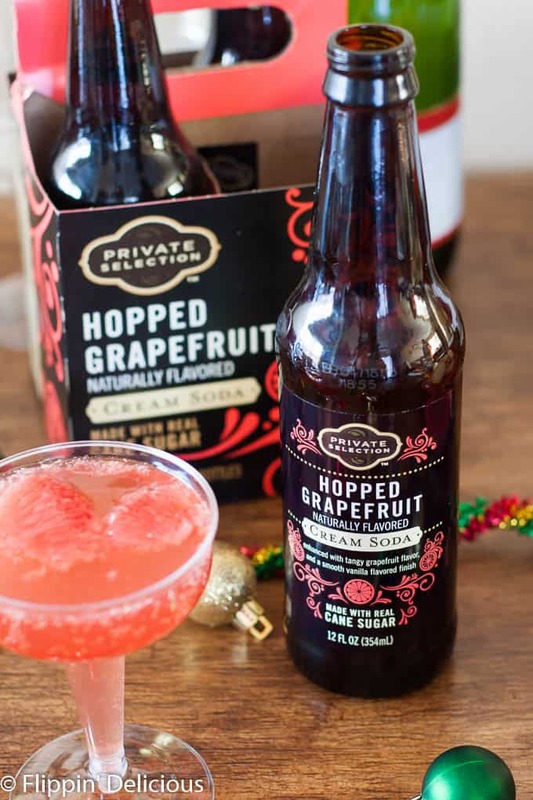 I made grapefruit mimosas by combining grapefruit segments and freshly-squeezed grapefruit juice with Private Selection Hopped Grapefruit Cream Soda. It is made with real cane sugar and has a delicious light taste! I just poured a little of the grapefruit juice into each glass, added 2 grapefruit segments, and then filled the glass the rest of the way with the grapefruit cream soda. 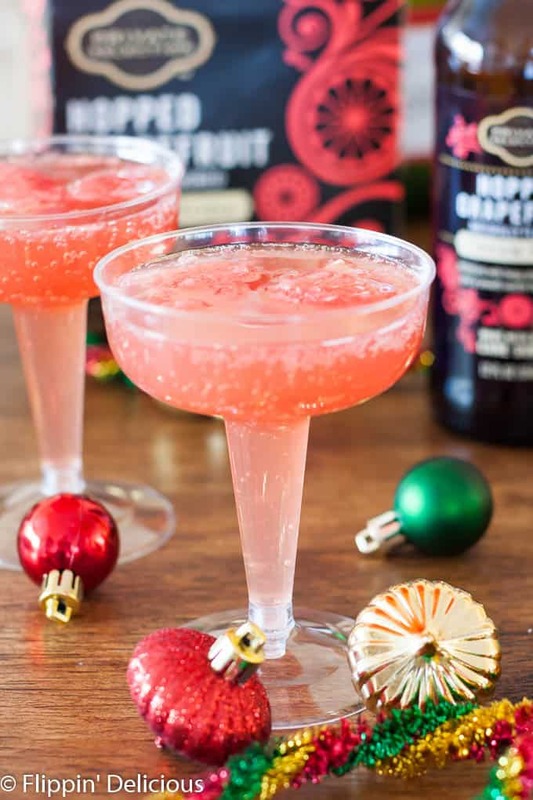 You can add a little prosecco or champagne to make it a real mimosa, but my father-in-law doesn’t drink so we saved our prosecco for the next time! 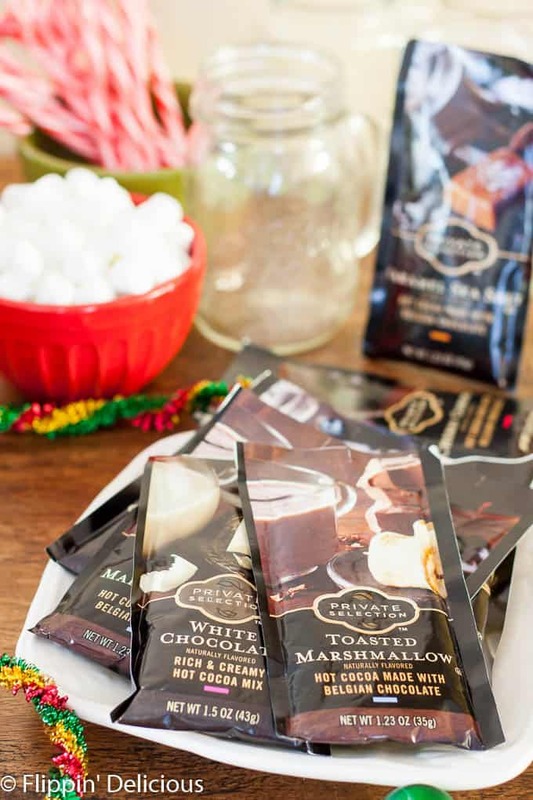 For our hot chocolate bar I picked up several Private Selection hot chocolate mixes at Smith’s and set them out with hot milk, a bowl of Kroger mini marshmallows, and some candy canes for stirring. The hot chocolate bar was a huge hit with everyone, but especially with the kids! Private Selection has several indulgent hot chocolate flavors like Cherry Cordial, White Chocolate, Toasted Marshmallow, and Sea Salt Caramel that were perfect! Miss E’s favorite was the white chocolate! I love that I was able to get everything I needed for our gluten free holiday brunch (ingredients, drinks, and decorations) in one stop! 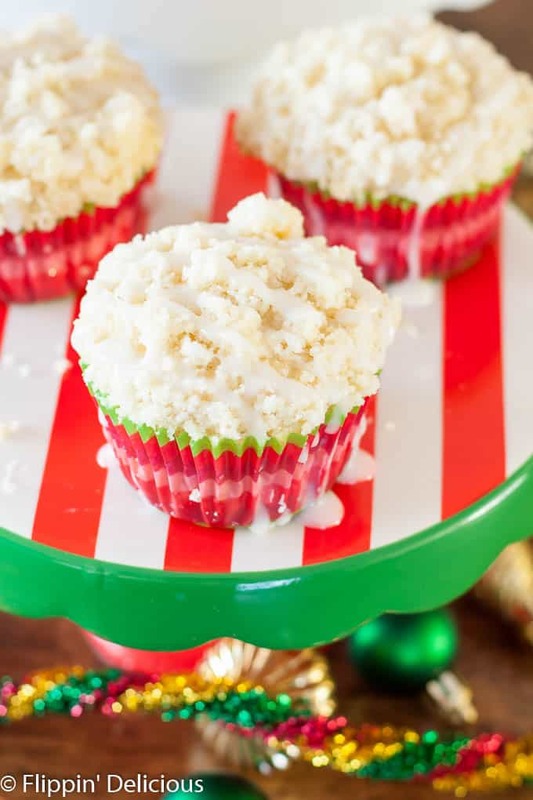 These Gluten Free Eggnog Muffins are the perfect way to celebrate #NationalGlutenFreeBakingWeek or add to your gluten free holiday brunch spread! Preheat your oven to 400F. Line your muffin pan with holiday muffin liners. In a mixing bowl whisk together the baking mix and sugar. Make a "well" in the center. Add the eggnog, egg, vanilla, and nutmeg to that well. Gently whisk the wet ingredients together, and then mix them into the dry ingredients. Scoop the batter into the muffin liners, filling each cup about ¾ full. In a small bowl combine the baking mix and sugar. Cut the butter into the mixture until it resembles coarse breadcrumbs. Sprinkle the crumbs evenly over the muffins. Bake in the preheated oven for 15-18 minutes, or until a toothpick inserted in the center of a muffin comes out mostly clean. Whisk the powdered sugar, eggnog, and nutmeg together until smooth. Drizzle over the cooled muffins. These muffins look absolutely amazing! I cant wait to try them! Yum!! 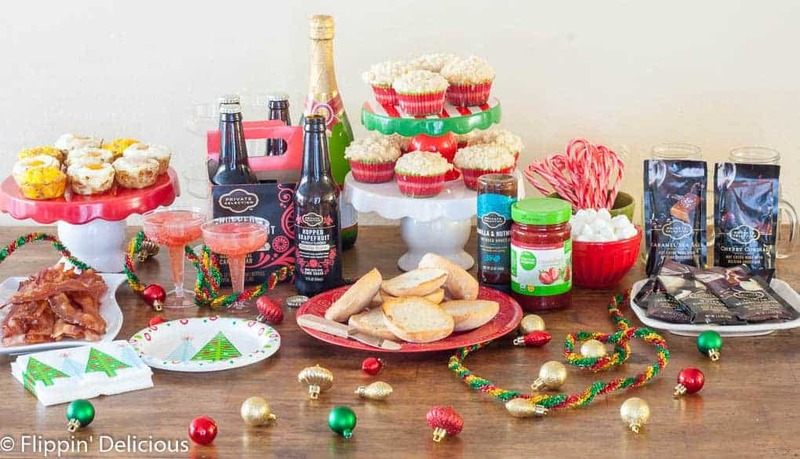 Such a fun festive spread! Love those beautiful cupcakes with all of that frosting!!! Do you think I could use your gf flour mix instead of the store brand? These sound amazing! Sure! Just add about a 1 1/2 teaspoons of baking powder and 1/4 teaspoon of salt for every cup of flour.